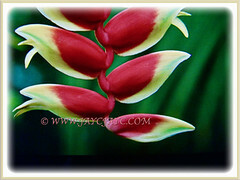 The Lobster Claw is an exotic species of Heliconia with stunning and long-lasting flowers that are downward-facing. 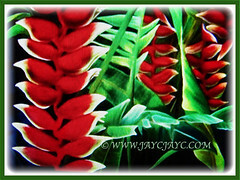 This beauty is unique and differs from other Heliconias whose flowers grow in an upright position. 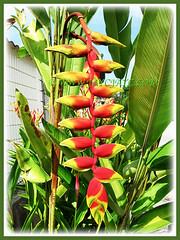 Heliconia rostrata is the national flower of Bolivia in South America. Botanical Name: Heliconia rostrata (syn. 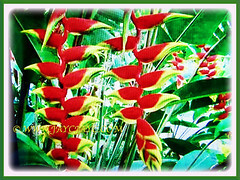 : Heliconia poeppigiana, Bihai rostrata/poeppigiana). 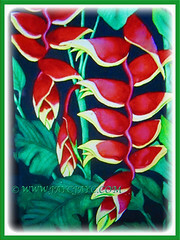 Common Names: Lobster Claw, False Bird of Paradise, Hanging Heliconia. 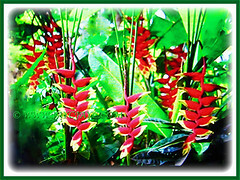 Etymology: The genus name Heliconia is derived from the Greek word helikonios which was the religious place of assembly of the Ionian League. The common name False Bird of Paradise, refers to its close similarity to the Bird of Paradise flowers, that is Strelitzia. Origin: Native to Peru, Bolivia, Colombia, Costa Rica and Ecuador in South America. Plant type: An ornamental, perennial and rhizomatous plant. 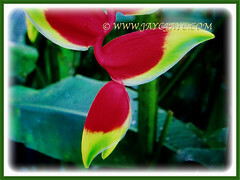 Features: Heliconia is a genus of 194 known species of flowering plants. A vigorous-growing, erect and clumping plant that grows up to about 2.13 m tall. It produces banana-like foliage with leaves that are glossy green, oval and paddle shaped. They grow in an upright habit with the flower stems in the centre. Heliconia rostrata’s stunning and long-lasting flowers face downwards, differing from the other heliconias with upright inflorescences. The large and brightly hued flower bracts are arranged in terminal racemes. It has insignificant tiny flowers covered by the showy bracts. The Lobster Claw may be found in red, orange or yellow, usually tipped with a bright gold splash. New stems will develop from underground rhizome after the old plant has flowered, creating a continuous display of the captivating inflorescences. 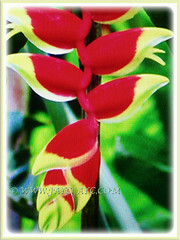 Culture (Care): Heliconia rostrata or Lobster Claw can be easily grown with minimum care. Best to mimic the conditions that are similar to a tropical rainforest with humid and warm environment. Light: Full sun, filtered sunlight or semi-shade. Moisture: Medium water needs. Once established, it is moderately drought-tolerant but will grow and flower better with regular watering. Soil: Humus-enriched, loamy and well-draining soils. It prefers a slightly acidic soil. Others: Deadhead the flowers and foliage to keep the plants tidy and aesthetically pleasing. Cutting off the stems regularly with stimulate new growth from underground rhizomes which will result in more flowers. A hardy plant that is generally free from serious disease or insect problems. However, do watch out for leaf spot, root rot, four-lined plant bug, caterpillars, root-knot nematode. 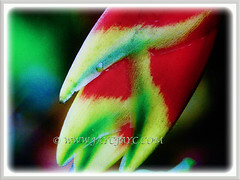 Heliconia rostrata or Lobster Claw is not at all frost hardy. Therefore, it is not suited for growing outdoors where cold temperatures are common. Freezing temperatures will damage and kill the rhizomes. Some species are excellent choices for container plants that can be grown indoors for the winter or in green houses, and moved outdoors during spring and summer. Propagation: By underground rhizomes, whereby the rhizomes can be broken into pieces and used to start a new plant. It can also be propagated by clump division. Usage: Heliconia rostrata or False Bird of Paradise with their showy and pendulous flowers are excellent specimen or accent plants for tropical gardens. Great too for container gardening. Most suited for tropical garden landscape, and mass plantings in garden beds, borders and parks. 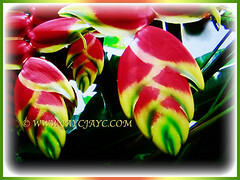 Their exotic and long-lasting ornamental inflorescences are superb as cut flowers for floral arrangements. Also, their leaves and herbaceous stems can be included to add uniqueness and artistic beauty.